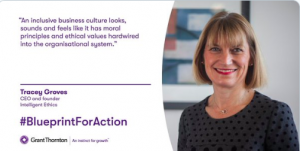 I am delighted to be recognised as a Women in Business Champion as part of Grant Thornton’s Global Campaign 2019. Read my full interview here on inclusive leadership, building a trustworthy organisational culture and engaging the hearts and minds of those who care. During the interview I talk about how inclusion is built on the ability of leaders to empower, motivate and inspire others to be the best that they can be. An inclusive culture is forgiving, and it is accepting. It is not driven by fear or anxiety. A sense of collective excitement and a ‘we’ mindset, rather than ‘me’, lies at the heart of inclusive leadership. Leaders who provide clarity in times of uncertainty, respect our humanity in a technologically-enabled world and position life-long learning at the heart of their own and others development, will ultimately nurture a high-performing, inclusive and high integrity culture.